What Should Your Future Salary Be? I just love New York Magazine. 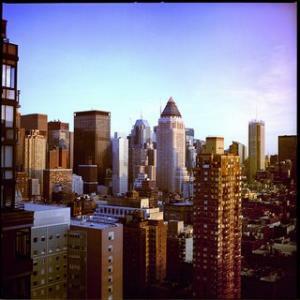 It provides me with everything I want to know about New York City, from restaurants to entertainment to politics to fashion. It even has a separate section online for shopping, apart from fashion. How lovely! The writing style is intellectual yet approachable, and if you have a sense of humor, you’ll be sure to catch onto the that of the magazine, as well. Whenever I decide to spend my own money on a magazine subscription and stop mooching off my parents’ regularly delivered issues, New York Magazine will be on the top of my list. 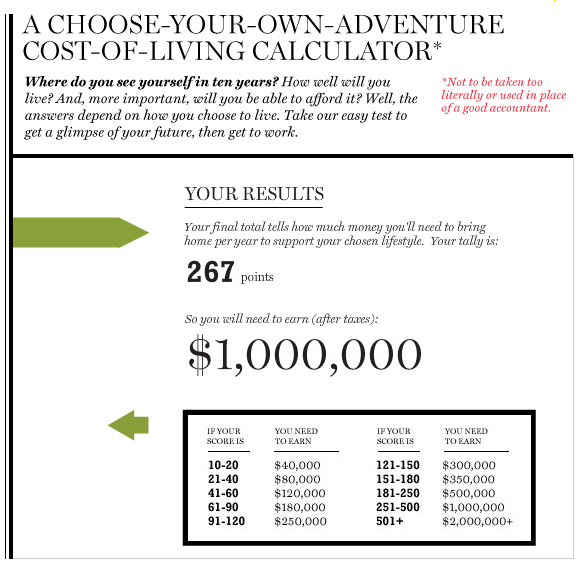 Another thing I love about the publication is their quirky little features, such as it the Choose-Your-Own-Adventure Cost-of-Living Calculator, which is actually looks somewhat like a game. I answered the various questions relating to my lifestyle in “the next 10 years” (I pretended it was going to be the next 15-20 years because I’m only 20 now!). Thanks to good ol’ NY Mag, I now know that I need to earn $1 million to live the life I aspire to have one day in New York City. Can you beat me? Some families choose to sacrifice what they could have in other towns to live in New York. I know a family of 4 living in a one-bedroom apartment. Now, they do live in the heart of the West Village, a dream of many, but I’m sure people usually think the parents would at least want their own bedroom. This family has been doing this since their kids were born, now 8 and 11 years old, and they seem to be perfectly satisfied with their lifestyle. The bedroom consists of a full or queen size bed (I can’t remember which one) for the parents and a bunk bed for the boy and girl. I don’t know what they rent is, but this is quite the sacrifice to make to live in one of the nation’s most sought-after neighborhoods. They could probably settle for a small house in the surroundings suburbs or get a less expensive, bigger place in a different neighborhood or even borough. I just wonder what will happen when the kids get older and want to bring home their girlfriends/boyfriends… Uh oh. 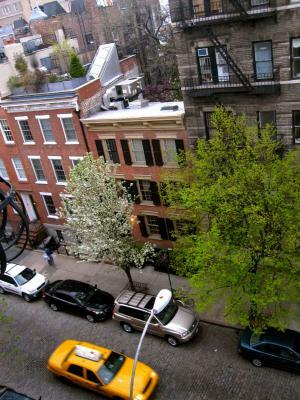 If you’re seeking to live a well-off lifestyle in New York City when you get older, you better plan to have a very well paying job and marry rich. (This goes for guys and girls.) A New York Times article called “You Try to Live on 500K in This Town” explains just how expensive New York can be. After calculating costs of private school, mortgage, nanny, and co-op maintenance fees, the article states, “We are already at $269,000, and we haven’t even gotten to taxes yet.” Now, the expense listed in this article may seem a tad excessive to some, but to many in New York, these things are parts of the lifestyle they are accustomed to. New York’s high cost of living is partially due to it’s low dollar value. In a New York Magazine article, “The Value of a New York Dollar,” the New York dollar was stated as being worth only 76 cents. That measly amount was calculated back in 2006, was when the article was published. Because of a number of factors, including regulations and zoning, housing caused the dollar’s value to drop 14 cents. Taxes drag its value down 5.6 cents, while basic costs like the higher prices in New York, decrease it even more by 4.4 cents. These are all further explained in the article, as well as the difference in lifestyle costs and wages. The money you earn and spend in New York does not go as far as it does in other cities. The New York Dollar is, by definition, “calculated by subtracting the additional cost of living in New York, and then adding back the additional income residents tend to command as a result.” It’s common knowledge that the cost of things in large cities are going to be more expensive than in small towns. But do you know just how big this price difference is? 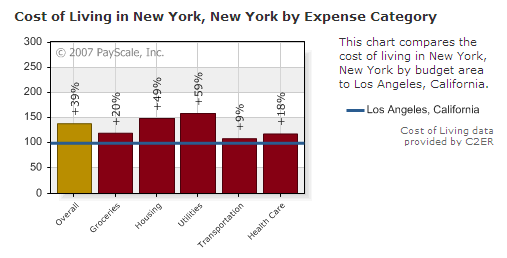 The cost of living in New York City is much higher than it is in other cities. However, the salary one earns in the city also is higher in comparison. (Though, it may not always be high enough to accommodate the difference of cost of living.) For instance, an Information Technology Director living in Tallahassee, the capital of Florida, has a median income of $147,493, according to Salary.com, while a person who holds the same position in New York, NY earns a median income of $193,881. To find out how far your salary can go in any city, take a look at the CNN Money Cost of Living Calculator and the PayScale Cost of Living Calculator.